Is It Easier to Get B Visa in China Now? The most recent B visa refusal rate released by the Department of State shows an interesting trend in China: it has been heading lower and lower in recent years. 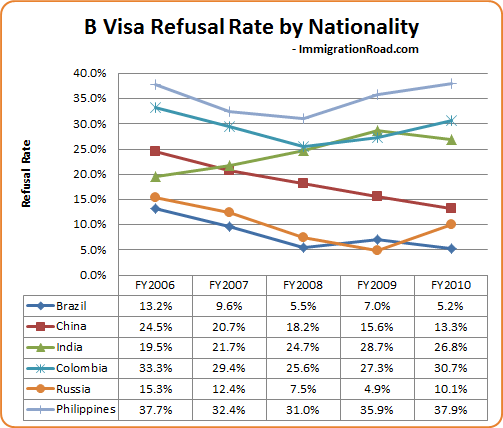 In 2006, 24.5% of B visa applications, including B1, B2 and B1/B2, were rejected in China. In FY2010, the refusal rate was down to 13.3%. See the curve below for more details. First of all, I had always thought that the rejection rate would be much higher than 20 some percent, based on anecdotal evidence I gathered throughout the years. But I’m willing to trust DOS’ statistical data. I forgot where I read it, but State officials commented on this very subject, claiming that there was no policy change or memo to intentionally grant more visas to Chinese visitors. And U.S. embassies and consulates have been maintaining the same standards while reviewing B visa applications. It wouldn’t be a bad policy though. The US’ gloomy economy could definitely use a few dollars brought in by foreign tourists. Chinese travelers, especially those wealthy enough to visit the United States, have a reputation of being big spenders. It sounds like a perfect win-win situation to me. Another possible explanation for the continued drop in refusal rate is that China’s tremendous growth in recent years has changed people’s perspectives. For many Chinese, it is no longer an attractive option to ‘immigrate’ to the United States by over-staying their visas. Consulate officers may have noticed the shift, and adjusted accordingly by granting more visas to legitimate visitors. Now the question for Chinese travelers is, does it feel like easier to get a visitor visa? This entry was posted in Travel, Visa. Bookmark the permalink.